An SD card is about the size of a postage stamp and weighs approximately two grams. It is similar in size to a MultiMediaCard, but smaller than older memory card types such as the SmartMedia card and the CompactFlash card. Both MMC and SD cards provide encryption capabilities for protected content to ensure secure distribution of copyrighted material, such as digital music, video, and eBooks. 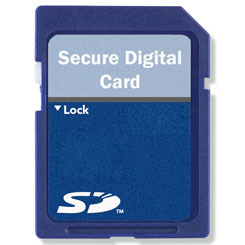 SD cards are available with storage capacities of 1GB, 2GB, 4GB, 6GB, and 8GB. 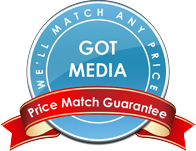 SD cards are more rugged than traditional storage media. They have an operating shock rating (basically, the height you can drop them from and still have them work) of 2,000 Gs, compared to a 100-200 G rating for the mechanical drive of the typical portable computing device. This translates to a drop to the floor from 10 feet, as compared to a single foot for the mechanical disk drive. Both MMC and SD cards use metal connector contacts, instead of the traditional pins-and-plugs,so they aren't as prone to damage during handling.